The Arts and Humanities stream of study has come to be seen as the problem child in university education in Sri Lanka. The employability of an Arts and Humanities graduate is lower than those in other disciplines. Even in the US, the salaries for faculty in Arts is lowest paid in academic hierarchy. This phenomenon has largely to do with massification of higher education, where large numbers of students, lacking numeracy skills would join the Arts stream thinking it is an easy sail. It is not so. A good Arts and Humanities degree imparts good analytical thinking, creativity and other attributes of a good education. In early days of higher education, the study of Arts and Humanities was the centre of the academic universe, but with advances in science, medicine and engineering, Arts and Humanities has taken a backseat. In 1956, C.P. Snow, in his famous essay titled ‘The two cultures’ lamented the separation of Arts and Sciences. Professor E. O. Wilson, American biologist and author of ‘Consilience’, published in 1998, predicted that Arts, Humanities and Social Sciences shall be rejuvenated through a marriage with the sciences. He envisioned social sciences to be enriched and changed with our knowledge of how the brain works, for example. That has not happened quite yet, but, interestingly, what is emerging is a marriage between technology producers and scholars of Arts and Humanities. When Google announced in 2011 that it was hiring 4,000 Arts and Humanities graduates, it made headlines. In fact, now it is not uncommon for a CEO of a tech company to have an advanced degree in philosophy and a lead member of his team a degree in theatre. In fact, the future demand for soft engineers may not be as spectacular as now, but people without a tech degree are expected to benefit most from if tech sector boom continues. In developing countries, Arts and Humanities education is still not ready for the real world. Rote learning which Asians seem have embraced as a second nature is at its worst in Arts education. A typical Faculty of Arts and Humanities in Sri Lanka will have an impressive array of departments dedicated to Philosophy, Social Sciences and Aesthetic studies such Dance, Music and Drama for a total of 937 faculty members in the university system according to our last count in 2005. Most of these faculty members have used political correctness, nationalist claims or even intellectual laziness to hide behind a vernacular firewall. It will take a massive infusion of scholarship from outside of the system to bring Arts and humanities education in this country to develop the human capital ready for the 21st century. What we need is a new kind of intellectual versed in Arts and Humanities but sufficiently numerate with the ability to build bridges to data scientists who have the tools but not insights to use them, for example. We need a generation of graduates who are programmers but avid readers, artists with facility for technology or economist who understand human behaviour and so on. We encounter such individuals outside of the universities in the blog-sphere and social media, for example, but our universities are nowhere near. This is a lacuna to be noted by our corporates or philanthropists if they are inclined to endow a chair in a university or venture into the business of education themselves. The University of Ceylon was established in 1942 on the banks of the Mahaweli with some of the most elegant university infrastructure found anywhere in the world. The elite of the day took the lead in birth of the university and some of them became administrators and teachers as well. Sir Ivor Jennings was the first Vice-Chancellor. As Prof. Senake Bandaranayake notes, the pre-war era had its share of home-grown intellectuals in the form of Senarat Paranvitana, Martin Wickramsinghe, Lionel Wendt, Justin Deraniyagala and others, but the university brought together a concentration of intellectuals such as Ediriweera Sarathchandra, KN Jayathilake, Rev Walpola Rahula, E.W. Adikaram, M. W. Sugathapala de Silva, K. Kailasapathy, J Thambiah, Gananth Obeseykere and other scholars in Arts and Humanities. The system was not sustainable. The demand for upward mobility through education was more than the system could bear. Scholarship by nature is elitist. No need to apologise for that. However, there was a feeling in the fifties that the politicians and civil servants of the day were out of touch with reality. The ensuing resurgence of Sinhala Buddhist nationalism carried with it some anti-elite sentiments that impacted the academia as well. After several cycles of turmoil, today, the public universities have been purged of the elite, but the institutions have become wastelands. The beginnings of the decline can be traced to the insurgency of 1971. When the University re-opened in 1972 after a year of more of closure, the new undergraduates entered an institution in the throes of decline. Elitism was declining but so was quality. The oil crisis of 1973 too severely limited the availability funds. The Amphitheatre, the Arts theatre where a film society membership gave one free screening of artsy films every week, the well-stocked library by the banks of the Mahaweli, were all skating on previous glory. In mid-1960s even science students who were hitherto required to study in the English language were required to sit for GCE O/L examination in Sinhala or Tamil. A few lucky ones were able to use the opportunity to continue to read English texts and supplementary readings, but, think freely in the mother tongue. However, the majority was happy to do with away English altogether and rely on a single textbook and the teachers’ words. The practice continues to date with nobody even bothering to read in Sinhala either. Instead students have delegated the ‘read and comprehend’ part to tuition masters. In the university this superficial approach to learning continues with a form of peer-tutoring known as kuppi classes. During and after the second insurgency 1987-1989 and afterwards, JVP backed students brought fear and intimidation to the university to eliminate traces of scholarly elitism along with free expression from the university. 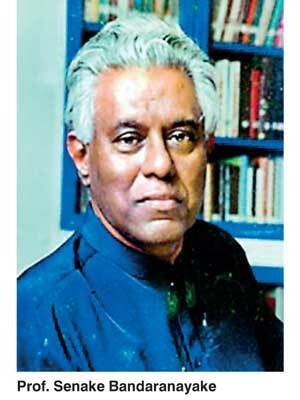 The brutal killing of Daya Pathirana, a student leader in the University of Colombo, by a rival faction in 1987 was a landmark in that respect. In 2004, I had the opportunity, with the encouragement of late Prof. Senake Bandaranayake, to develop a quality indicator for faculty in the humanities and social sciences. A key finding was that one fourth of the academics did not hold any post-graduate qualification and one third held only a Masters for a local university often from the same department from which one graduated and now serving. Quality of student data is more anecdotal. A typical student in Sociology, for example, would have followed a series of courses on sociology of this and sociology of that, but would not be able to give a writing sample in electronic form and would not be able recall reading a single key scholarly book outside of the notes. Given the high level unemployment among of present Arts graduates, policymakers are looking at ways of reducing the intake. What we need is an effort increase the quality at the same time. The University Grants commission is made up of three medical professionals, an engineer, a physicist and a finance professor and Dr. Wikrema Weerasooriya, a lawyer with a breadth of experience outside of the academia. Whether this group will give Arts and Humanities the quality boost it deserves is yet to be seen. The National Centre for Advanced Studies in Humanities, established by Prof. Senake Banadaranayake with good intentions, has predictably become another glorified tutory by all appearances. Whether it can be rejuvenated as a place for scholarly work or whether a centre of excellence in Arts and Humanities can be established outside of public sector in a private university or research institute are ideas to be explored.